Mufti Mohammad Ali Falahi narrates that he remembers the days when he and his brothers would come to Mumbai from Tadkeshwar and Moulana Abdur Rahman would shower them with precious advice. He would always encourage them to study and learn as much as possible. Mufti Falahi recalls a number of Jumaah bayans delivered by Moulana Abdur Rahman in the Jameah Masjid of Santacruz in Mumbai. His bayans were very touching and emotional. He was a very simple person who always dressed in white and was always inviting people to the Masjid and encouraging them towards religious activities. One day, in the Jumaah bayan, with tears in his eyes, Moulana Abdur Rahman said that when Almighty Allah questions me on the Day of Judgement – that Abdur Rahman what have you brought forth – I will respond by saying I have brought Husain Ali Battiwala. Allahu Akbar. What a great person he was. One of the most humble requests he made to all was to pray for his children to receive right guidance. He himself prayed night and day for the right guidance of his children. Later on in life, Moulana Abdur Rahman moved to Holland which was to become his final abode, and that was where he passed away. ILWIIR. There will be a Bayaan everyday after Asar Salaah by Mufti Mohammad Ali Falahi Saheb, except Friday’s and Sunday’s. There will be a Bayaan before Jummah Salaah at 1.05pm every Friday by Mufti Mohammad Ali Falahi Saheb. Shab-e-Baraat begins on Monday 30th April 2018 after Maghrib. There will be a Bayaan and Dua programme after Maghrib on Monday 30th April by Mufti Mohammad Ali Falahi Saheb. The recording of Madrasah Anisul Islam’s 8th Annual Jalsah is now available. 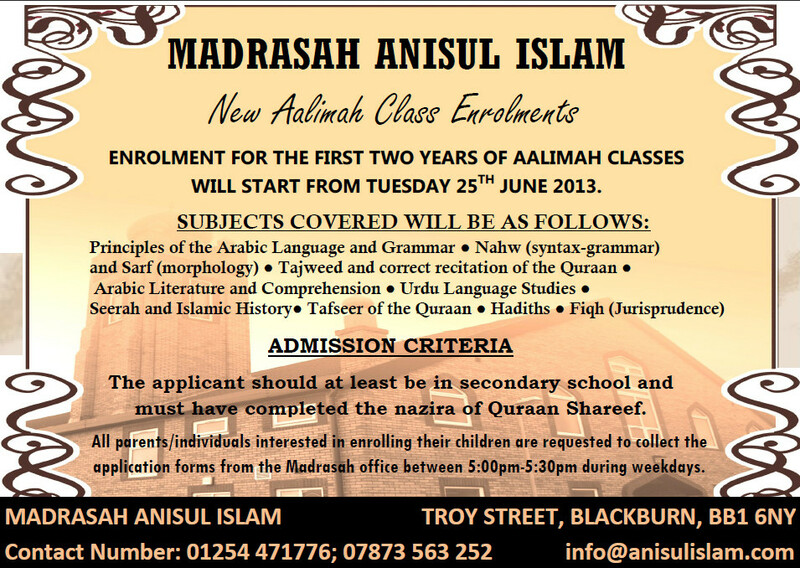 Madrasah Anisul Islam are introducing Aalimah Classes. Enrollment for the classes starts from 25th June 2013.